Discover the benefits of media training and do all your media interviews with confidence. As a busy executive or business owner, doing media training may be the last thing on your mind. But whether you like it or not, there will come a time that you will have to face the media as part of your role. Then what will you do? Many corporate executives and business owners fall into the trap of going to media interviews without doing any media training or any preparation at all. Then they bungle it. 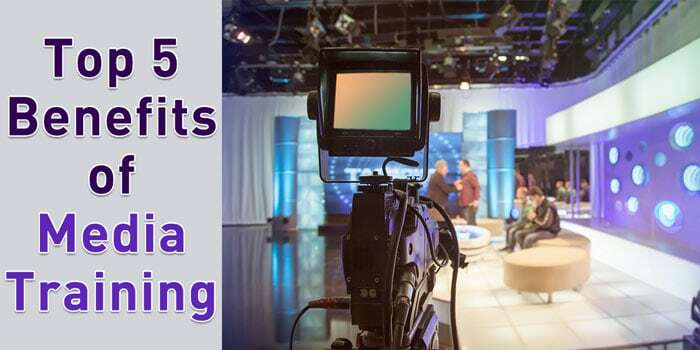 In this post we’ll give you some practical tips that will help you prepare for different types of media interviews and realise the benefits of media training. When done properly, a media training will give you tremendous confidence in doing media interviews. Instead of wriggling out of every media opportunity, you would be more prepared, confident and self-assured when interviewed by the media. Whether you will be on TV, radio or will be interviewed by a journalist for print or online media, your media training will go a long way in presenting yourself with confidence. And of course a confident you will project a positive image of yourself and your company. So, let’s get down to the nitty-gritty of media training. Remember, when it comes to dealing with the media (that means when you’ll be doing a media interview) even the small details matter. You’d be better off going into those interviews well-prepared. Here are the top benefits of media training that should work for your advantage. It is interesting to note that despite our almost constant exposure to various media channels, many people don’t really know how this influential group works. We know we get regular news updates on TV and online newspapers, but many of us don’t even know that there’s a team of journalists and editors working behind every story that airs on TV or gets into the front page of a newspaper. Many people don’t even know that for every article that gets published or aired, there could be at least two or three others that get canned. If you know how the media works, you can present your story in an interesting manner that will grab the attention of the media. As a corporate executive, business owner and the face of your company, it will be helpful for you to know or at least to have a basic understanding of how the media works. Why? Because it will help you in many ways when you deal with the media. If you know that your story (e.g. a positive story about your company) is competing with many others for the front page, you will realise how important it is to give the most important information to the media. If you know that a journalist has a 2PM deadline, you should try and meet that deadline by calling the journalist back before 2PM if you want to be included in the story. When you’ve done your media training, all these details which may seem small and irrelevant to you, will become clearer. Given the context of how the media works, you can tailor your messages and become more effective in dealing with these influencers. We know they all deliver news, information and entertainment. But they do it in different ways. And if you know how the various media channels differ from one another, you’re almost ahead of the curve. For example, if you will be interviewed on TV about your newest product or service offering, you better get in front of the camera ready with three or five key points. At the most, you will only have 3-5 minutes to convince your audience that you offer the best product or service. This is because as a medium, TV is all about limited airtime and visuals. This means short, sharp and catchy delivery of your message. With TV segments running in half-hour time slots each guest or interviewee is only given a limited amount of airtime. Compare that with newspaper or magazine. A journalist writing for a newspaper or magazine may interview you for at least half an hour. You will have time to give background information about your company and your products or services. The journalist may even ask you questions about how you got started in your role or your own business. When you’re interviewed by a print journalist, he or she would have time to review and analyse the information you’ve given. The journalist would have at least a couple of hours to write the article. Then an editor or sub-editor will spend time to review it before it gets finally published. So, in terms of delivery of news and information, TV is more immediate and instant compared to print media. If you know the differences between media channels, you will be more effective in delivering your messages accordingly. Though you don’t need to know each and every journalist that will interview you, it helps to have some basic information of their interview styles. Some journalists are more aggressive and hard hitting than others. If you know the interviewing style of the journalist you’re about to talk to, then you can prepare accordingly. And while you can’t anticipate all the questions in advance, you should have a high level knowledge of the interview topic before you agree to it. In a recent article, Mark Laudi, an ex CNBC news anchor, wrote about why you lose if you break an interview because you don’t like the questions. It is an interesting article that paints the reality of media interviews. Sometimes you get asked questions that you don’t like but you still have to answer. No point walking out of the interview or picking a fight with the journalist. You will be the only loser. When you do your media training, you will learn the different interview styles (of journalists) and how you can adjust or tailor your responses. This is closely related to the previous two benefits. And knowing the requirements of different channels and the people (journalists) behind them will be a huge advantage as you prepare for media interviews. It goes without saying that the more you know the media (channel) and the journalists you’ll be talking to, the better you can prepare for each interview. There is no point in preparing a 20-page background information if you know you only have 60 seconds on the radio or two minutes on a TV segment. On the same vein, you wouldn’t want to go into a newspaper or magazine interview (about you and your company) without any statistics, product information or supporting documents to show your success in the business. When you do your media training, you will have a good understanding of how you can tailor your messages for each media channel. All media trainings must include a mock interview segment when you’ll be asked different questions to simulate real live interviews. If your media trainer is not doing mock interviews, you should demand one. Because really, what’s the point of a media training if you won’t be asked different questions. Most of the people we have done media training with appreciate the mock interview session. This is their opportunity to be asked difficult questions without the pressure of giving the wrong response. You must have seen many instances (of live interviews) where the interviewee got the shock when asked a difficult question. Aside from the fact that you have to answer the question right there and then (in a real interview situation), you’re also under pressure to give the right answer. But what if there’s no right answer. This is when the mock interview during your media training will come handy. Again, while you can’t anticipate all the questions that may be asked of you, once you have had the chance to go through the different questions, it will be much easier for you to respond to difficult questions. Or at least, you will have the time to prepare for those tough questions before they get asked. Whether you’re in for a media interview soon or in the near future, consider doing a media training first. It could be your best investment of time and effort in presenting a positive image for yourself and your company. If you have any media training or media interview questions, please contact us and we will be happy to chat with you.